ThinkPad is one of the most popular Lenovo device series thanks to the traditional models and their durability. The E lineup, part of the ThinkPad family, targets consumers who need a durable and budget device. Lenovo ThinkPad E460 fits namely in this category, and this is why we decided to review it. You may have read our review of Lenovo ThinkPad E560 (15″) or that of a 2-in-1 ThinkPad representative – Lenovo ThinkPad Yoga 460. We were quite happy with these devices in terms of their performance, portability and reliability, and now we can’t wait to test their brother ThinkPad E460. Its performance is better than that of Yoga 460 thanks to its discrete GPU R7 M360, and we shall check how this will affect our temperature tests below. The laptop used for this review is a testing sample so it did not come with a manual or a charger. Nonetheless, we can be certain that when you buy a ThinkPad E460, you will get a charger, power cable and user manual. This E-series model is no exception to the traditional design of budget ThinkPad devices. Once you get it out of the box, you will notice the Lenovo logo on the lid, as well as the inscription confirming that you now own a ThinkPad device. As you may guess, the notebook uses the typical matte black color without unnecessary inscriptions – the design language is simplistic, as expected. One of the first aspects that caught our attention is the low weight of the 14-incher – only 2 kg. And we must not forget that on the inside there is the discrete GPU R7 M360 (in comparison to Yoga 460 which counts on Intel HD Graphics). This is a key advantage that makes E460 a good choice if you need to have your mobile device at hand wherever you go. Additionally, the gray metal hinges stand out, while the corpus is reinforced with carbon fibers. The latter seems sturdy and durable – rather important for a business laptop. When opened, the typical ThinkPad traits become visible. Also, the TrackPoint is red and sits in the middle of the keyboard. It allows you to move the mouse cursor, which is great if you are used to it and don’t want to use Lenovo’s touchpad. As far as the keyboard is concerned, it preserves the traditional ThinkPad design. The ergonomic keys, called AccuType, are comfortable and easy to type because of their slightly peculiar design – they are “smiling” and slightly protruding in the middle, as well as decently spaced so that you won’t press several of them at a time. Since it’s a 14-incher, the NumPad block is not present which means slower input of digits but, on the other hand, ThinkPad E460 has a good number of function keys for quick access that facilitate your work. Also, the touchpad is positioned below the keyboard. It is relatively big and comfortable despite E460’s small size. Some of the configurations feature a fingerprint scanner on the right, but our unit did not have this. The touchpad ensures fast and adequate operation. Above it, there are three buttons (left, right and one for scrolling) that make your work even easier if you are using the TrackPoint. Despite its compact size, ThinkPad E460 offers enough ports that you can use for peripheral devices, external drives, flash drives, etc. On the left, there is a headphones jack, USB 2.0 port, and Kensington Lock – fortunately for us the cooling vent is also on the left. Most ports are to be found on the right, which isn’t exactly good if you want to use a mouse. On the right, you can observe two USB 3.0 ports, HDMI, LAN Ethernet, as well as the DC power jack. Lenovo ThinkPad E460’s display uses a TN matte panel with a model number LEN40A0. It is 14″ (35.56 cm) and its resolution is 1366 х 768 pixels. The screen ratio is 16:9, the pixel density – 112 ppi, and the pixel pitch – 0.226 х 0.226 mm. It can be considered as “Retina” when viewed from a distance equal or greater than 79 cm (from this distance, the eye cannot recognize the separate pixels). Lenovo ThinkPad E460 offers uncomfortable viewing angles. For the purpose of quality evaluation, we present to you 45° degree perspectives. Before calibration we measured maximum brightness of 216 cd/m2, and maximum deviation of 11% across the surface. The average color temperature measured upon white surface and at maximum brightness is 7690 K.
To make sure we are on the same page, we would like to give you a little introduction of the sRGB color gamut and the Adobe RGB. Starting with the CIE 1976 Uniform Chromaticity Diagram that represents the visible specter of colors by the human eye giving you a better perception of the color gamut coverage and the color accuracy. Inside the black triangle, you will see the standard color gamut (sRGB) that has been used by millions of people in HDTV and on the web. As for the Adobe RGB, this is used by professional cameras, monitors and etc. for printing. Basically, colors inside the black triangle are used by everyone and this is the essential part of the color quality and color accuracy of a mainstream notebook. Still, we’ve included other color spaces like the famous DCI-P3 standard used by movie studios and the digital UHD Rec.2020 standard. Rec.2020, however, is still a thing of the future and it’s difficult to be covered by today’s displays. The yellow triangle shows Lenovo ThinkPad E460’s capabilities. A 53% sRGB coverage is insufficient for saturated colors. Below you will see practically the same image but with color circles representing the reference colors and white circles being the result. You can see the main and additional colors with 25%, 50%, 75% and 100% saturation inside the sRGB gamut before calibration. The difference before and after calibration is noticeable. The new profile has been set to 140 cd/m2 and 6500K white point. We used X-Rite i1Display Pro as a calibrator tool. Below you can see the results from the accuracy color checker with 24 commonly used colors like light and dark human skin, blue sky, green grass, orange etc. Color accuracy isn’t bad – avg DeltaE 2000 = 2.03. Its contrast is low – 380:1 before, and 230:1 after calibration. We present to you some of the colors in our color accuracy report in the below histogram. Lenovo ThinkPad E460’s display doesn’t use PWM only at maximum brightness, irrespective of whether it’s plugged in or counts solely on battery. However, if you are using a different brightness level, PWM will be present at a low frequency – 200 Hz, which can be harmful to people with sensitive eyes. In conclusion, Lenovo ThinkPad E460’s panel is not quite up to date. The main advantage of this notebook is its price. If you normally work with an external monitor and you are on a budget, then a purchase of this device will make sense. Lenovo Thinkpad E460 has decent stereo sound. The lows and mids are clear and nice. However, there are some irritating deviations in the highs. The sound output has a very good maximum value. Lenovo ThinkPad E460 features a 48 Wh battery that made us quite happy because the more powerful ThinkPad E560 has an identical battery. We expected even better results from the bigger brother because its 6-cell battery had to supply the ULV Intel Core i5-6200U and less powerful R7 M360 GPU (in comparison to E560 with its Core i7-6500U, Radeon R7 M370 and IPS panel). To confirm our high expectations we conducted our three mandatory tests – Web browsing, HD video playback, and gaming. As you may guess, we used the usual conditions – Wi-Fi and Power saver turned on, and screen brightness set to 120 cd/m2. In comparison to E560, which held up for 4 hours, the result was much better here – 5 hours and 52 minutes. Since we registered almost 6 hours in the previous test, we could not expect less than 4 hours of video playback – and we got 4 hours and 56 minutes. In this test, most laptops we review register between 1 and 2 hours of play time. ThinkPad E460 held up for 2 hours and 46 minutes. Here you can see an approximate comparison between the CPUs that can be found in the Lenovo ThinkPad E460 models on the market. This way you can decide for yourself which Lenovo ThinkPad E460 model is the best bang for your buck. Fritz is a chess benchmark which tests the computing capabilities of the CPU with various chess moves. The Intel Core i5-6200U managed to get 5.537 million moves per second. In comparison, one of the most powerful PCs, Deep(er) Blue, was able to squeeze out 200 million moves per second. In 1997 Deep(er) Blue even beat the famous Garry Kasparov with 3.5 to 2.5. Radeon R7 M360 is a graphics card based on the Tonga chip released in the second half of 2015. It supports technologies such as DirectX 12, Mantle, OpenGL 4.3, OpenCL 1.2, Vulkan and FreeSync. The base operating frequency of R7 M360 is 1015 MHz, and there are two variants with either DDR3 or GDDR5 memory. In our case, it was 2 GB GDDR5 (and this is expandable up to 4 GB DDR3). The GPU performance has been increased over the previous generation equivalent model R7 M260. If we have to compare it to a competitive NVIDIA model, GeForce GT 920M has similar specs and both chips share similar performance. This chip boasts not only the above-mentioned technologies but it is also energy efficient. The two processes Enduro and ZeroCore are the reason for this. On the one hand, the former automatically switches to the integrated GPU whenever R7 M360 is not engaged. On the other hand, the latter reduces the chip’s energy consumption when the display is off. Thanks to them the machine needs less power supply, and thus they preserve both battery life and the device itself. Here you can see an approximate comparison between the GPUs that can be found in the Lenovo ThinkPad E460 models on the market. This way you can decide for yourself which Lenovo ThinkPad E460 model is the best bang for your buck. This final part of our review provides some insight as regards ThinkPad E460’s cooling system, its hottest points, and the comfort after a continuous workload. To ensure accurate results, we put the laptop to a really harsh test, which is almost impossible to achieve if you are working with conventional software. As usual, we begin with a 100% CPU stress test. After one hour Core i5-6200U maintained an average temperature of 67 degrees Celsius, and the maximum we reached was 69 degrees. Despite the not so low temperature and considering that this is chip is ULV, Intel Core i5-6200U preserved its maximum operating temperature of 2700 MHz, which is great news. After an hour we launched the parallel GPU stress test so as to engage the complete potential of the cooling system. AMD GPUs are a tad hotter than those of NVIDIA, and the one in ThinkPad E460 is no exception. After the two most significant for the system chips had been fully loaded, the temperatures rose up to 91 degrees. Additionally, the hottest point on the surface was slightly below the screen – 52 degrees – but we it did not cause discomfort. ThinkPad E series targets users who are after quality on a budget. ThinkPad E460 answers this need, as you may see from the above tests. This compact and budget solution is a very good choice for those of you who are frequently on the go and need a relatively light mobile notebook at hand. Additionally, this laptop is lightweight and offers “standard” build quality as a ThinkPad device – reinforced chassis and reliable metal hinges. This taken together with a very durable battery make E460 a notebook that suffices all requirements business users may have. Also, its sound is loud and clear, and the lows and mids are nice and clean, which is a plus if you are into music. 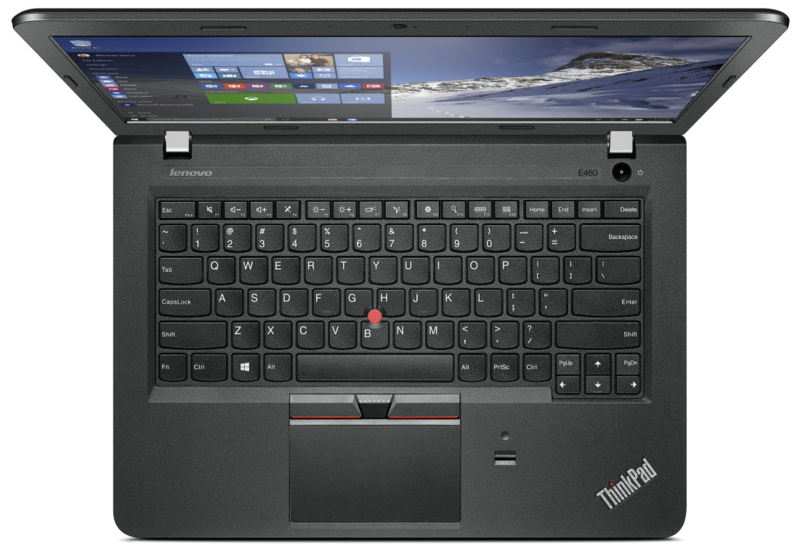 The only Lenovo E-series laptop with an IPS panel is ThinkPad E560. All other models feature a TN display. Having this in mind, ThinkPad E460 is not a good choice if you want to do some photo or video editing. This is also due to its poor sRGB coverage as well as limited viewing angles. What is more, you can avoid PWM only at maximum brightness (irrespective of whether the device is plugged in or counts on its battery).